On more than a few nights, I’ve heard coyotes around my cabin, for they typically hunt in pairs, howling and yipping back and forth to keep track of where the other one is. 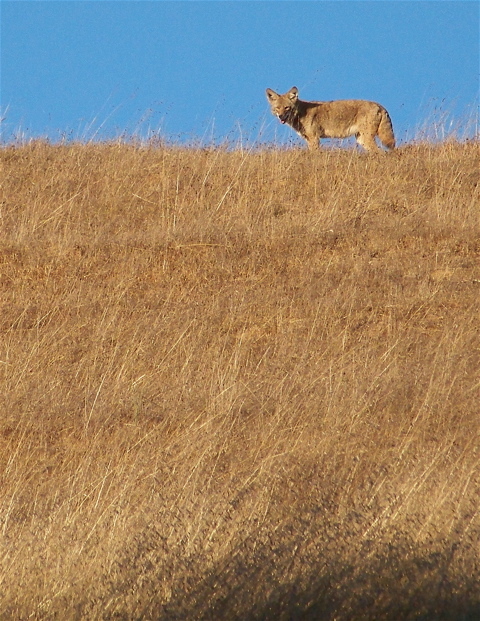 I’ve seen coyotes in the Point Reyes National Seashore, as well as beside Nicasio Reservoir and on Highway 1 near Campolindo Way in Point Reyes Station. Last Thursday, however, was the first time I managed to not only see but photograph a coyote close to the house. 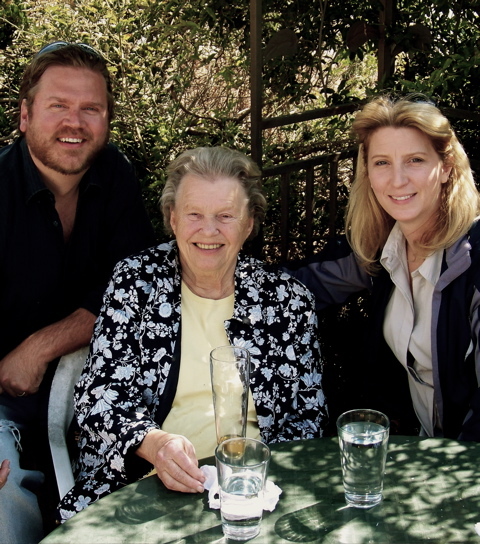 As it happened, last Thursday I drove Seeva Cherms, daughter of Linda Sturdivant of Inverness Park, to Novato and back. As we pulled up to my cabin upon our return, Seeva spotted an animal lying in the grass just uphill from where I was parking. “Look!,” she exclaimed. “There’s a coyote!” Because it was still bright daylight, I was initially skeptical. From its color, it could have been a deer, but when the coyote stood up, there was no mistaking it. Luckily I had my camera in the car, and as I took it out, the coyote began ambling uphill slowly, giving me a chance to shoot several photos. There were no coyotes in West Marin for 40 years because of poisoning by sheep ranchers in northwest Marin and southern Sonoma counties. However, coyotes never disappeared from northern Sonoma County, and after the Nixon Administration banned the poison 10-80, they started spreading south and showed up here again in 1983. 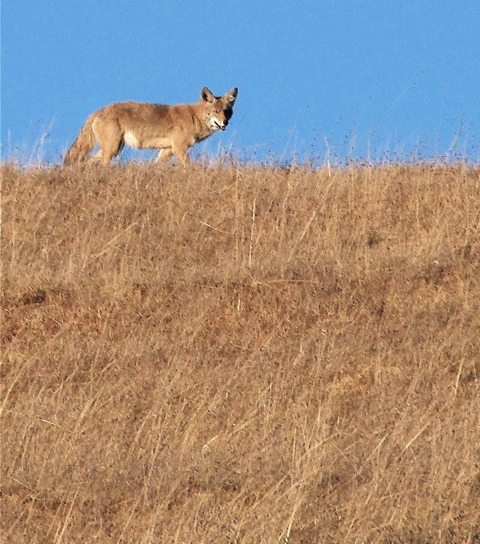 Since then, coyotes have put an end to well over half the sheep ranching around Marshall, Tomales, Dillon Beach, and Valley Ford. Coyotes, which evolved in North America two million years ago, can now be found from Alaska to Panama. In fact, their name in English is derived from coyotl, which was given to them by the Nahuatl tribe of central Mexico. Unlike many predators, coyotes have actually benefited from the European settlement of North America. Most significantly, the white man eliminated many of the wolves that prey on coyotes. A brief clip from the National Geographic Channel of a wolf-coyote encounter (with a happy ending) can be seen by clicking here. Modern society has also encouraged the spread of coyotes by providing them with food sources ranging from abundant garbage to small pets. As a result, coyotes live longer in suburban and urban areas than they do in the wilds, according to a study conducted from 2000 to 2007 by Ohio State University researchers. The researchers determined that roughly 2,000 coyotes live in the Chicago metropolitan area alone and concluded comparable populations could be found at other US cities. Two years ago, in fact, a coyote was captured in Manhattan’s Central Park. 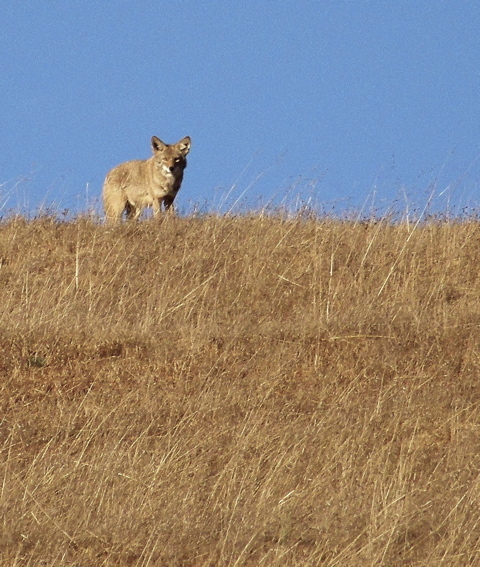 Other than rifle-toting sheep ranchers, mountain lions are the only significant threats to coyotes in West Marin, and in the wild, coyotes can live up to 10 years. While coyotes have been known to mate with wolves, their more common inter-species dalliances are with domestic dogs. Indeed, not too long ago, various people walking female dogs near Abbott’s Lagoon were horrified when they spotted a male coyote heading toward their pet — only to discover the guy wanted to get it on with Lassie, not devour her. Although the only “wildland” my property interfaces with, other than neighboring households, is a horse pasture, I took the notice seriously. I can recall a breakfast 13 years ago when from my dining-room table I could see towering flames sweeping down Inverness Ridge on the other side of Tomales Bay. That fire destroyed 45 houses and blackened 12,000 acres. It was so intense that for two hours on the morning of Oct. 4, 1995, the fire consumed roughly an acre of wildland per second. In short, fires spread all too easily. As noted here three weeks ago, fires swept through Tomales in 1877, 1891, 1898, and 1920, destroying much of the town each time. The Marin Independent Journal last November reported: “Pete Martin, a retired Marin County Fire Department captain, said [in a meeting at the Mill Valley Community Center] there have been 10 major fires in Marin, starting in 1881 when a Corte Madera farmer burning brush sparked a 65,000-acre fire. 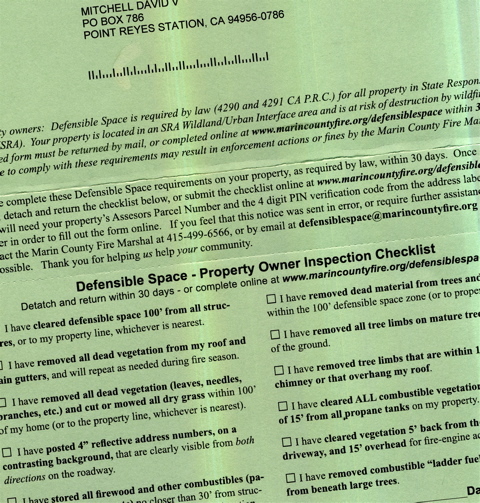 Last July, I had hauled two pickup-truck loads of brush and limbs to a fire department disposal site in Olema, but after receiving the fire chief’s letter, I set out to clear away some more. I cut low limbs off 10 pine trees plus an ornamental tree of unknown variety with a trunk as hard as iron — and just about as heavy. I cut back coyote brush along my driveway, and for the third time this year, I trimmed grass around my cabin. It was strenuous work, especially because much of the cut foliage had to be dragged nearly 100 yards to a brush pile at the foot of my driveway. Some of the work to be done, however, required more than time and sweat. I had already felled one dead pine tree this summer, but now I was confronted with a significantly larger one. In addition, some large limbs hanging over my roof had to be removed, and I figured it would be risky for both me and the roof to climb a tree with a chainsaw and cut them off myself. 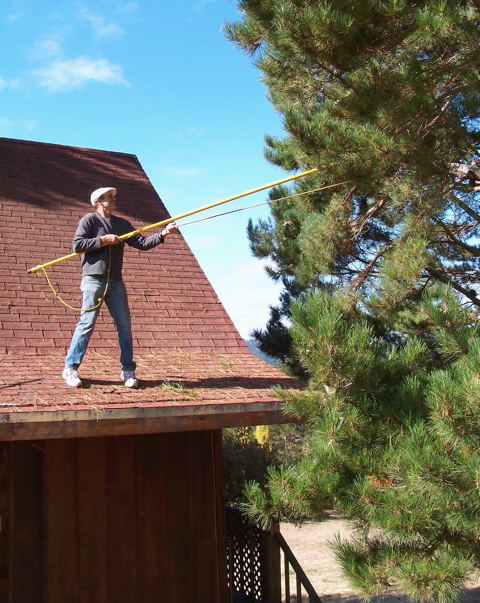 Nick Whitney uses a pruning hook to trim small branches off one pine tree before cutting larger branches off another. So I called Nick Whitney of Pacific Slope, and last Thursday he and his crew of tree trimmers showed up. 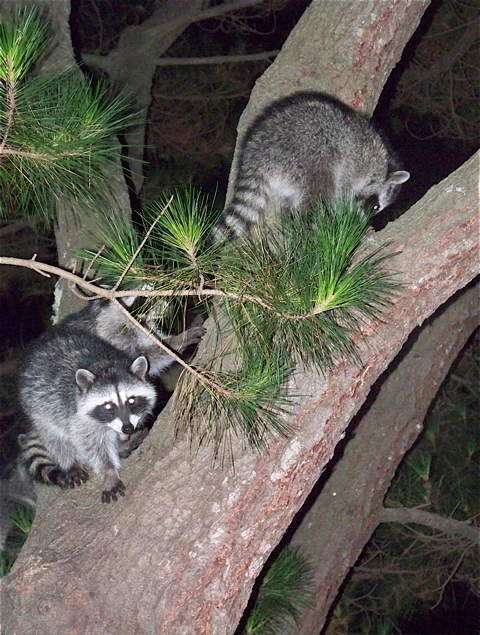 The three of them spent half a day felling the dead pine, cutting branches away from my roof, using a blower to clean pine needles from my rain gutter, chipping all the foliage they’d cut, chipping my own brush pile, and then hauling all the chippings away. 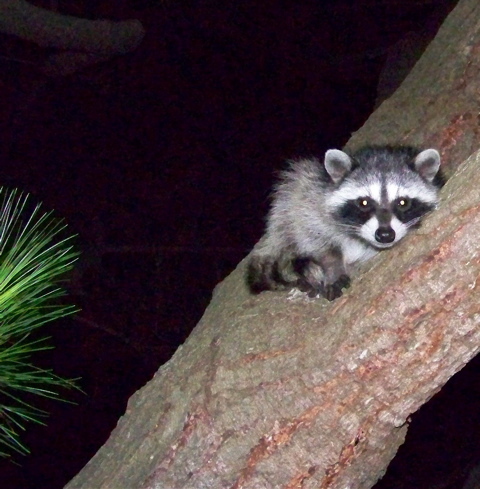 By the time they left, my cabin looked noticeably less vulnerable to wildfires. It is obvious that numerous homes in Inverness and Inverness Park, as well as throughout the San Geronimo Valley, are nowhere near compliance with the fire department’s orders, so on Friday I was feeling a bit smug when I paid a visit on friends in Inverness Park. As it happened, I was outdoors talking to Terry Gray when a drizzle that soon turned into light rain began falling. Now that warm weather is back, however, that may not be the case. 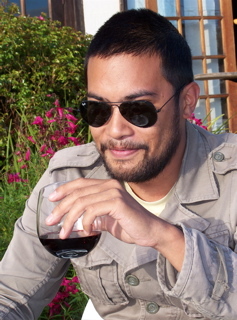 Tomales again this weekend showed it’s a town that knows how to party. The 2000 census listed Tomales’ population as 371 (the third smallest of the 14 towns in West Marin, ahead of only Dillon Beach, 319, and Olema, 245). 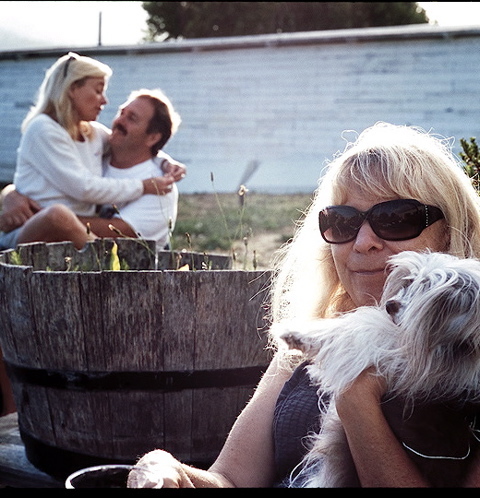 However, the few folks who live in Tomales are known for hosting notable bashes — from a 200-biker Hells Angels’ barbecue in 2004 to its yearly Founders’ Day. Although a wine-tasting booth in the town park was doing a brisk business Sunday and the beer booth sold out its entire inventory, the William Tell bar was crowded inside and out. In front of the bar, a band played, and some folks danced. 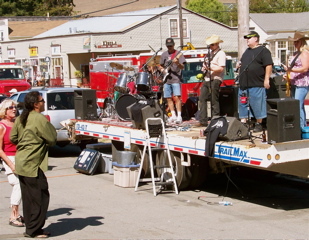 Tomales on Sunday resumed its annual Founders’ Day celebration, which includes a parade up Highway 1 through downtown followed by a picnic in the park, complete with food, beer, and wine booths. Last year the celebration couldn’t be held because the town park was in the midst of an improvement project. The project isn’t finished yet, but already new restrooms and new playground equipment are in place. The park is bordered with a new — but rustic — fence. Using split railroad ties, volunteer Bill Jensen built a fence like those traditionally found on local sheep ranches. Stabilized with handsome retaining walls made of stone, terraces — where families now picnic and children play — have been dug into the hillside. And therein lies a story. 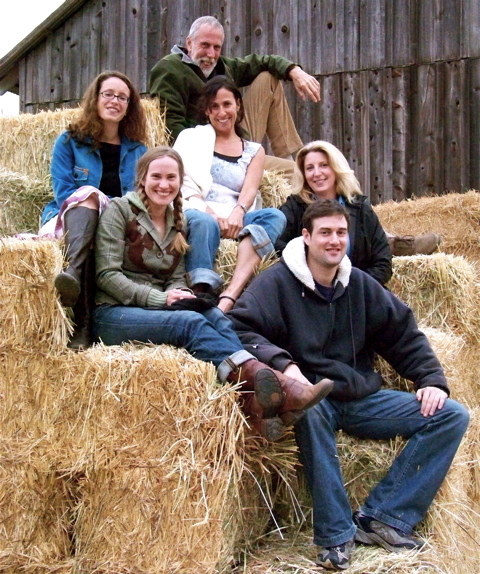 Because many of Tomales’ ranching families have lived there for generations and care about its history, the town maintains an ambitious Tomales Regional History Center. 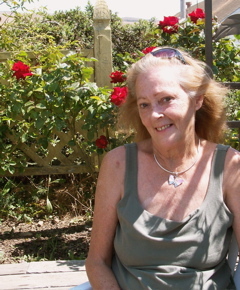 Syndicated cartoonist Kathryn LeMieux, who lives in Tomales, is a volunteer at the museum, as well as a former member of its board, and one day during July 2007, she received a call from contractor David Judd, who’s in charge of the park renovation. Kathryn ought to come down to the park, he said, and “look at all the old things we’re digging up.” David said he’d have the bulldozer work elsewhere for a while to give her a chance to sift through dirt that had been moved, and Kathryn immediately became fascinated with what she found. 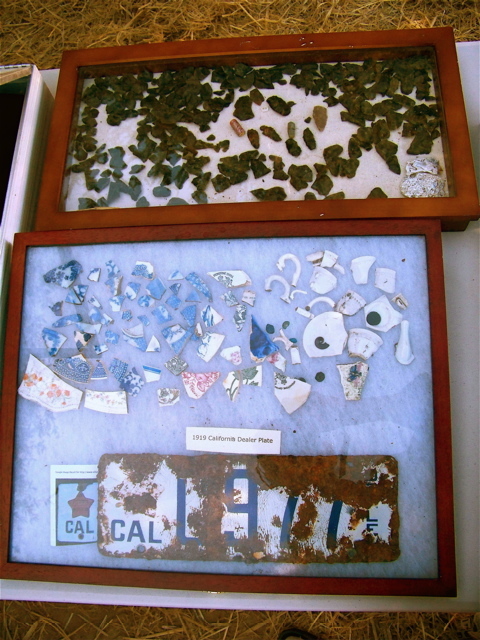 In the top four feet of soil were old bottles, Miwok arrowheads, and broken China. A year later, Kathryn is still inspecting dirt in the park and, in fact, found obsidian from an arrowhead on Sunday. 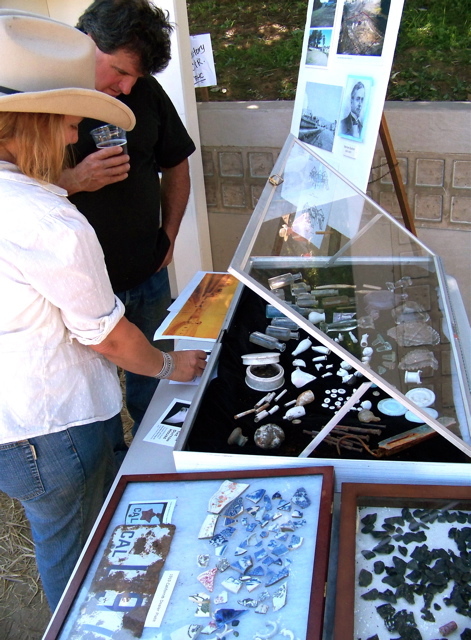 Townspeople were captivated by the trove of archeology Kathryn (seen above with Bill Bonini) revealed in the town park on Sunday, and it was one of the highlights of Founders’ Day. Just south of Tomales, Highway 1 runs alongside Walker Creek, and it happened that last Thursday when I drove this stretch of road, I came up behind a car that was barely moving. Looking around to see why it had slowed, I spotted two deer wading across Walker Creek. So I pulled onto the shoulder and watched. 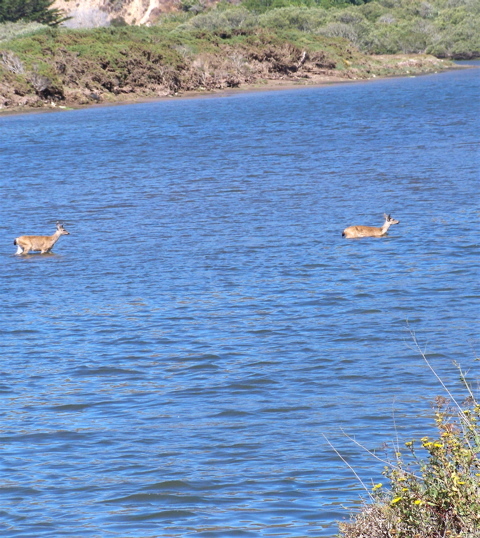 Eventually, the water got too deep for the deer, and they had to swim the last 50 feet or so, coming ashore no more than 25 yards upstream from me. Once the site of a Miwok village called Utumia, present-day Tomales was founded by Warren Dutton, who began building settlements in the area during the 1850s. The town gained prominence in 1875 when it became a stop on the new narrow-gauge railroad, which ran from Sausalito across Marin County to Point Reyes Station and then north to Cazadero. Tomales, however, is a town that has had to keep rebuilding itself, for it has been struck by one disaster after another. Town fires in 1877, 1891, and 1898 each destroyed numerous buildings, as did the 1906 earthquake and yet another town fire in 1920. In 1930, the last train pulled out of town, just as Prohibition and the Great Depression were also dealing Tomales economic blows. Tomales’ population today is about 40 percent below its peak a century ago, and its largest employer is merely good old Tomales High. Nonetheless, townspeople have persevered, and the Founders’ Day crowd sounded almost giddy as they admired the work being done (much of it by volunteers) at their park — and the antiquities being unearthed. Sparsely Sage and Timely is powered by	WordPress 4.9.10 and delivered to you in 0.375 seconds using 39 queries.